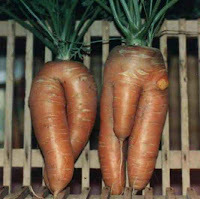 You know the funky looking carrots with two legs that amused you so much as a child, or the rutabagas that bear a closer resemblance to, say, Mother Teresa than other rutabagas? Turns out, it's been illegal to sell them in markets of the European Union. Until now. The New York Times reported today that EU lawmakers have waived standardization restrictions on a wide number of fruits and vegetables, meaning that misshapen produce can now be sold in stores. Even more bizarre is that several countries have opposed this easing of regulations.